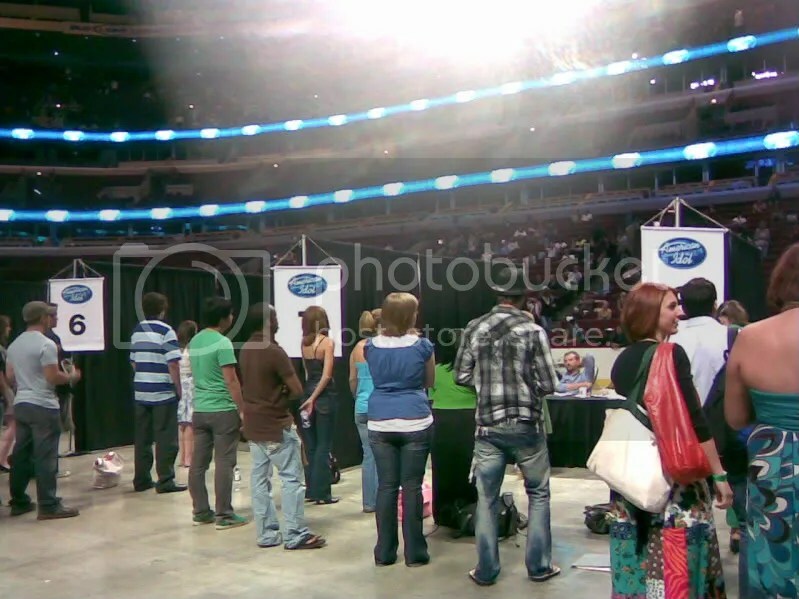 Yesterday, the producers of American Idol came to Chicago to hold preliminary auditions at the United Center. I dragged SW with me to register on Saturday; although I have never even seen a complete episode of the show, I knew I would regret missing such a nearby opportunity. We feared that the lines would be overflowing, but by 3PM, the lot was empty, and we simply walked in and received our wristbands and tickets. We were told to keep our wristbands on until our auditions on Monday — the instruction sheet advised us to wrap our wrists in plastic so as not to get them wet. I duly adhered to these directions, in spite of how lame it made me feel. Sunday night, I took the Metra [by myself for the third time, woot] downtown to sleep over at SW’s apartment; the registration people told us to start lining up at 5AM — yeah right! Thankfully, I had read these instructions and was not as intimidated by their ridiculous demands. As long as we had our tickets, we had seats. 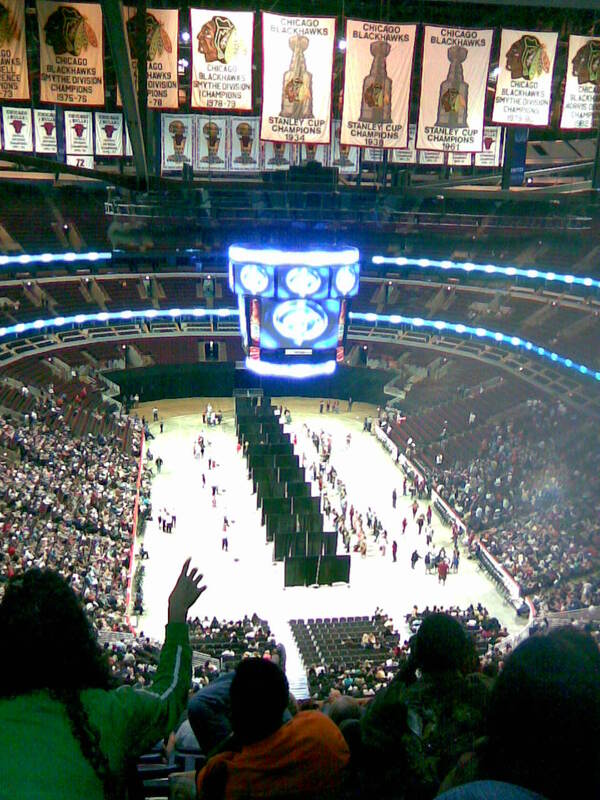 SW and I arrived at United Center at around 8AM, having decided to skip the frivolous group song [Kary Perry’s “Hot & Cold”] and other antics. The parking lot cost an astounding $21, so we just found a place on a nearby street. Coca-cola had a very strong presence in the parking lot where we waited. People handed out cold Coke Zeros, and a huge screen was set up on the side of a Coca-cola truck for contestants to play Guitar Hero. The sun was not yet shining with its full force, so we enjoyed a slight breeze as we waited with the thousands of other hopeful people [inside, we filled up 2/3 of the stadium seats]. We were woefully unprepared, having forgotten to get bottled water and breakfast. Thankfully, I had half a bag of animal crackers, so we munched on those as we moved with the crowds towards the entrance. A random guy dressed up as Joker stood by the entrance. Throughout the day we also spotted a man dressed as a witch [with a pointy hat and green face paint and everything], a girl wearing a full-length dress with a pageant sash, and tons of skinny dudes wearing vests. Others ranged from totally casual to suits or heels. I thought it was a waste of time to get so dressed up for only one minute in front of the judges. As far as food and drink, each person was only allowed to bring in one bottle of water. My unfinished animal crackers went into a dumpster, as well as my unopened Coke Zero. Fortunately, a girl in front of us had an extra bottle of water that she offered to SW — otherwise we would’ve had to spend $4 on a Dasani from the extravagantly overpriced concessions. [Eventually, my rumbling stomach led me to purchase an order of nachos for $5.75 anyhow.] Our seats were in row 16 of the 310 section, which is incredibly high up. The altitude gave me a bit of vertigo as we walked up and down the stairs, and I avoided standing when the producer ordered us to rise and cheer for the camera. Do they even use that footage anyway? I wouldn’t know. Contrary to what the uninitiated might believe, the famed judges and host do not show up for the first round of auditions. In fact, from what the more experienced contestants around us said, those who make it through the first round have to go through numerous other auditions in order to whittle down the numbers for Simon Cowell & co. How, then, do those with an obvious lack of talent make it far enough to face the famed judges? Are they in on the farce, or do they truly believe that they can win? American Idol staff set up curtains dividing the 12 audition stations, at which one or two judges [producers from the show] would evaluate four contestants at a time, each individual having only a handful of seconds to show off their talents. The actual auditions started at 9:30, starting with the first level. The few chosen winners were given “golden tickets” and sent through the winners’ exit amid cheers from the crowd, while those who did not make it [and there were many of them] had their wristbands snipped off and exited through another set of doors. SW and I sat in our seats and caught up on sleep until it became unbearably cold. We then roamed the hallways, which were full of people chatting and practising their tunes, some with guitars, which they were not allowed to use during the actual auditions. Our section was not called until 5PM; by then our minds were shot with idleness [forgot to bring reading material] and we just wanted to get the process over with. I could not imagine that anyone who was not serious about getting onto the show would be willing to wait for such a long time, but I was proven wrong when two of the girls that went before us turned around to warn SW and I that they were only present to make their third friend look good, and proceeded to audition terribly [none of them made it through]. Although we had the whole day to prepare our songs, I still felt a rush of nervous adrenaline when I finally stood before the judge. The curtains did little to filter out the sounds of others singing or cheering, which added much distraction. Because of the immense number of contestants, the judges did not have time to give out any advice. In a British accent, our judge rejected the four of us politely, encouraging us to try again next time. Next time? I think I’ve satiated my desire for this show — if I want to get famous, I will pour my efforts into another outlet. You are currently reading I Want To Be The Very Best at auradis.